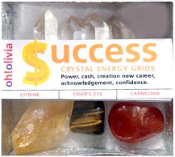 I have created crystal energy grid kits for manifesting SUCCESS, to bring in energy to heal the missing aspect in your energy field, and then take out your new energy to the Universe. Perfect for someone who may need an advance in their career, needs CASH ASAP, and is also good for "creation energy" for either a pregnancy of a baby, or new business endeavor. A stick of Palo Santo is also included in the kit with instructions on how to set-up, bring in, or keep out energies, how to clear stones, and crystal healing information information. Place layout of SUCCESS KIT in your bedroom to keep energies working on you as you sleep. When we sleep our spirit leaves our body and travels in other realities. This grid will keep your physical body absorb the SUCCESS frequency as you travel the realms. Can also be placed by your work station to enhance career. Also offering PROTECTION, INTUITION and LOVE kits, see other listings. - instructrions for "How to Clear Stones" and "How to use Palo Santo"